Hi Friends! Sorry--no freebie Friday today. Instead, I was able to spend some family time with my Dad, Mom, and Grandpa. *Happy Sigh* I've got a happy heart! Mom is eager to help me in my classroom to get it all set up! Mom is "retired" from teaching, but that doesn't stop her from subbing (just for my school!) and putting in lots of hours dreaming up ideas we can do with my kiddos. Does anyone else have a teacher Mama or Dad? Love it! Is anyone else out there tempted to change your classroom theme after seeing some of the adorable class pictures on blog sites and Pinterest (Crystal Jones, you know you're one of them that I'm talking about...you and your Western Theme!)?!? It is a good thing I've already invested (rather heavily!) 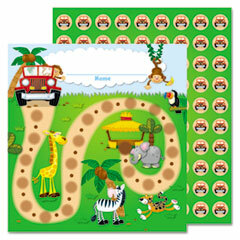 in my Explorer/Jungle Safari theme or I'd be changing my theme over and over! I like to make my own reward charts, but after I saw this, I just had to have it because it is so cute! A little safari trail and jeep stickers to move along the path. My local school supply shop didn't have these, but luckily Amazon did--and I just had to buy the matching bulletin board set, right? Then, they magically appeared on my doorstep via Amazon Prime. Blogging buddy Vicky is having a big 113 follower giveaway, so click on her picture below and get yourself entered! She's giving away an Amazon.com gift card and Mrs. Jones' Junction is giving away a gift certificate to her Teacher's Notebook store. Also, you have about one more day to enter to win my Hollywood Star of the Week packet. I'm also planning a BIG 100+ follower giveaway with over ten awesome prizes from many generous bloggers (anyone still wanting to donate prizes can email me cwoita@aol.com)! Be sure to stop back here this weekend to get in on the fun! Anyhow, I'm going to start working on some other goodies, so enjoy your weekend, especially all of you that have already started back to work! Ahhh Corinna!! That is ohhhhhh soooooo sweet!! 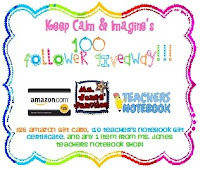 Small Correction-I am giving away a $10 Teachers Notebook gift certificate and any item from my store! Now see, if I still had my jungle theme I would have wanted to get that reward card and probably want the set too. It is too adorable!! I'm about to reach 100 followers and I am trying to think of a giveaway. Ah! I stand corrected! That's even better! Welcome, Kelly! Thanks for following!